The Hungarian Parliament elected her Judge of the Constitutional Court in September 2014, with the effect from 15 November. She graduated from the Faculty Eötvös Loránd University in 1981. She is specialist in economic criminal law. 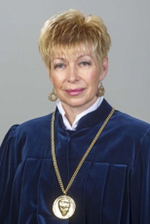 In 1984, she was appointed to judge to Central District Court of Pest, after that to the Buda Environs District Court. From 1994, she was the President of the Buda Environs District Court. From 1999, she was judge at Pest County Court. From 2003, she was the leading judge of the Criminal College of the Budapest-Capital Regional Court of Appeal. She obtained her Ph.D degree in 2012, the subject of her research was the human trafficking as the manifestation of organized crime. She has been teaching criminal law and criminal procedure at the Pázmány Péter Catholic University and at Károli Gáspár University of the Reformed Church. She is the President of the Consultant Judges in European Law and she is appointed as Contact Point of the European Judicial Network (EJN).